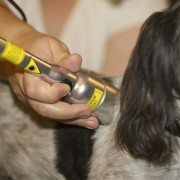 What is electrostimulation for pets? Electrostimulation is using an electrical impulse to a nerve within a muscle to help decrease pain, increase muscle strength, or both. Hang on a minute…..I’m picturing Frankenstein stuff….. When delivered appropriately and with proper training, electrostimulation should be ONLY a positive experience, particularly in our pets who can’t understand why we would do something painful even if it was helpful. Stimulation devices all have multiple properties which can be adjusted to get the desired effect without discomfort. Animals needing help with muscle contractions, usually with nerve damage. Examples are dogs with back fractures, slipped discs or nerve damage in a forelimb. What happens? Electrodes (which are the little gel stick pads that you think of for a heart monitor) are attached to the skin. The hair must be shaved or the contact is incomplete and then it hurts. The pads are applied over motor points. A motor point is the area inside the muscle where the nerve triggers the muscles to contract. The machine is set and turned on. It is then adjusted to assure there is no discomfort and so that the muscles contracts (the leg moves) for a short period of time and then releases for rest. As the patient improves, longer periods can be used so the muscle gets stronger. Why? Since the animals cannot use the muscle by themselves due to paralysis or nerve damage, we are creating muscle contractions for them. It is not the exactly same muscle use as weight bearing, but when the dog or cat is able to get back on their paws, they have some muscles to use and are not standing on jello. Ultimately, progress to function is much faster. Who? Animals with painful muscle spasms or tightly contracted muscles from compensating for another injury. Here the hair is shaved and electrodes attached as in NMES. In TENS however, the electrode is placed over a trigger point. A trigger point is a point in a muscle that hurts when it is touched. These are the points we instinctively rub on ourselves when we have an ache. The machine is set and turned on, then adjusted for comfort. Generally a gentle pulsing is most comfortable for the pet. Trigger points are tight balls of muscle fibers that due to pain, cannot let the contraction go completely. We usually say “I have a ‘knot’ in my neck.” The pulsing confuses the pain nerves which allows the muscle point to release, creating pain relief. This modality is not commonly used in pets, as trigger points can be painful until they release. These patients must be chosen carefully and their discomfort respected. Who? Animals with musculoskeletal disease, neurological damage or pain. What happens? Acupuncture needles are placed at appropriate points in the animal (learn more). Then electrode clips are attached to the needles. My clients often call these “jumper cables” as that is what they look like. The machine is turned on and slowly increased in intensity until the pet licks his lips or turns his head. This means he feels it. Then they are watched closely for discomfort and turned down if they are panting or otherwise uncomfortable. Why? The needles are a copper conductor that allows the electrical signal to penetrate better into the acupuncture point. Paralyzed animals and dogs with neuromuscular disorders seem to respond nicely to this technique. Electroacupuncture leaves a longer lasting or more complete effect than acupuncture alone for most animal patients. However, it should be used with caution. Some animals are sensitive to acupuncture in general, can appear quite relaxed at the treatment, but then are “wiped out” then next day or two. 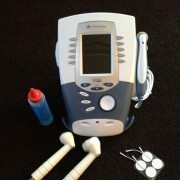 Overall, electrical modalities are used to help the “boost” the nervous system’s conduction of signals for the betterment pain management or muscle strengthening. 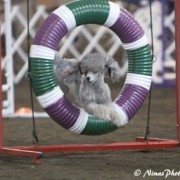 For canine athletes, whether agility, fly ball, disc dog, earth dog, dock diving, sled dog racing or any other canine sport, rehabilitation techniques and equipment can improve your dog’s longevity and performance in its sport. Plus, it gives you new ways to train your dog to keep you both entertained and out of a training rut. Teaching your dog new ways to exercise expands the range of the muscles and nerves, which is vital to protection from injuries. Improving strength: All athletes need muscles. The better your dog’s muscles are honed to your sport, they better they will perform. Conditioning techniques can improve muscles specific to your sport. 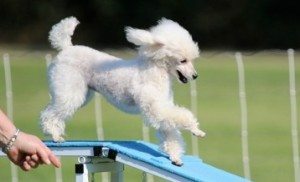 For example, an agility dog pushing a physioball focuses muscle work on the hamstring to improve its jumping strength. 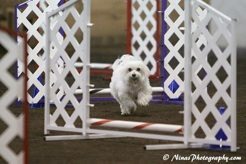 A fly ball dog working an obstacle course of multiple physioballs and disks alternating with firm surfaces works the muscles on the inside and outside of the legs creating better turns. Improving endurance: Think of the marathon runner. To increase endurance she can run MORE miles OR she can make those miles harder. This allows her body to work more efficiently and endure more speed during the marathon. 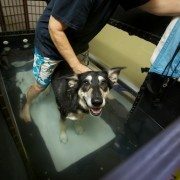 The underwater treadmill makes the “miles” harder for our sporting dogs. The water creates resistance. The incline creates resistance too. So a lure coursing dog that has been running the length of the course in the treadmill, now has more endurance for greater speed for that same distance on land. Preventing injury: Dogs injure themselves not on the perfect run or dive or turn, but on the one that is off just a bit – a divot in the grass, a slip on the wet grass from Portland’s rainy winters, too tight of a turn coming out of the tunnel, a slight distraction changes the dog’s head position as he runs. The ability to correct and recover without injury are entirely dependent training the nerves and muscles for this purpose. Physio work like the physioball or physiodisk simulates uneven footing and weight shifting. We do these exercises at a variety of heights and head positions. For our “blast off sports” like dock diving working turns is essential for them to adjust footing if they hit the dock at the wrong speed. For disc dogs, “straight line” work is needed, such as the land treadmill to maintain the tendons and muscles mass in appropriate alignment. Working to condition your dog with a rehabilitation specialist is like having a personal trainer for yourself. You know how to lift weights, but your trainer makes the work more efficient. You get bored with your routine, your trainer can suggest new exercises to help keep it interesting. And if you have an injury, your trainer can make sure you are exercising appropriately to protect the injury while maintaining endurance. Working with a veterinary rehabilitation specialist is like a personal trainer for your dog – you are still the coach for the big game but your rehab specialist is a valuable member of the team. By that same token, you wouldn’t want a personal trainer who is just a guy who’s in shape. Without appropriate training he may not know how other health factors affect your ability to exercise, he may not understand the way joints load weight for different body types, and he may not understand how you are motivated. 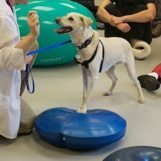 A CCRP (Certified Canine Rehabilitation Practitioner) or CCRT (Certified Canine Rehabilitation Therapist) has taken over 100 hours of course work, completed 40 hours of internships, presented cases for review and passed an examination in addition to being a veterinarian or veterinary technician. Only someone certified has the flexibility to work across sports, understands options and risks for injuries and can adjust exercises for different breeds and temperaments.